The perfect treat for an anytime snack. 3 ingredient White Chocolate Blueberry Tarts ready in 15 minutes! If you follow along on Instagram and Facebook you would have seen that we moved. My hubby got a new job and within a month we were packed and moved from the South to the Midwest! I’ve never lived in the Midwest so it is definitely going to be an adjustment. We’ve been in our new home for a week now and the kids are headed back to a new school this week. I am really not ready to let the summer go yet. I keep trying to figure out where it went. July and the beginning of August pretty much seem like a blur to me. When I made these peach tarts last month I knew I needed to make them again. 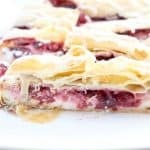 I have a feeling you guys are going to be seeing a lot of these tarts around here because they are so simple and easy to make and I don’t feel like I have to make a ton. I’m thinking the kids are going to love these for the first day of school! ENJOY! The perfect treat for an anytime snack.3 ingredient White Chocolate Blueberry Tarts ready in 15 minutes! Thaw puff pastry according to packaging. Lightly flour counter and roll out pastry with rolling pin. Cut into 6 equal squares. Cook at 350 degrees for 15 minutes. When done allow to cool for 5 minutes. Melt chocolate in microwave for 1 minute and drizzle on tarts. If only I had some of these for breakfast! They look so pretty. Wow! Hope you all adjust quickly and end up loving your new home & area! These tarts look REALLY good! I have a thing for cooked fruit…especially blueberries and plums. Mmmm! Thanks Colleen! We are slowly adjusting! So far so good! Wow – what a whirlwind month you’ve had! 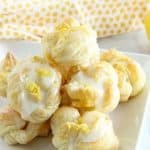 And I’m impressed that you are still giving us such delicious recipes here on your blog! Love how easy and delicious these tarts are! Awe thanks Martha! The month has definitely been crazy! I can’t get over how gorgeous these are. Who knew three simple ingredients could make such a perfect treat?! nothing wrong with lots of tarts…these are beautiful! Welcome to the Midwest! These tarts look so easy and delicious. I will have to make them for my kids. They are obsessed with blueberries! 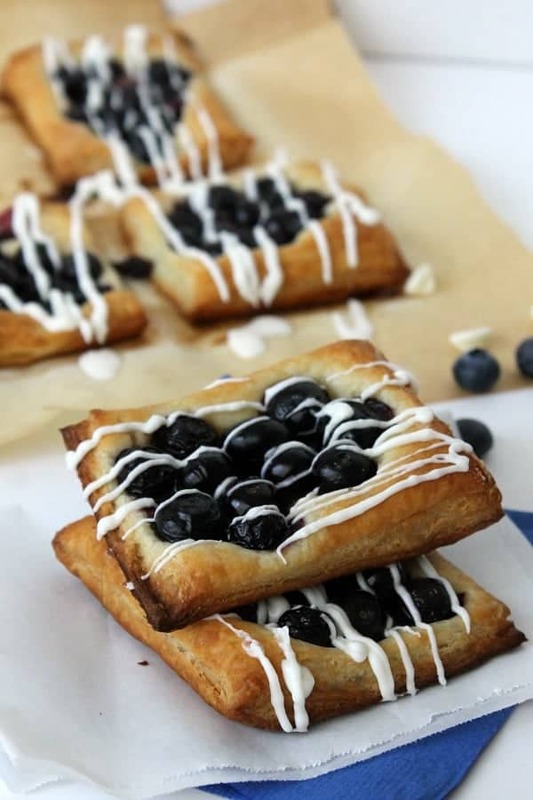 Puff pastry + white chocolate + blueberries? Winning! I think so too Melanie! Summer went by WAY too fast! 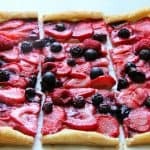 But if back to school breakfast includes these gorgeous tarts than I am all about it! I LOVEEE white chocolate! White chocolate is the best! Thanks Mariah! Moving is so exciting! These tarts look amazing too! That is the most perfect drizzle I have ever seen! These tarts looks amazing! Pinned! 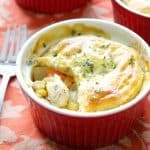 Justine | Cooking and Beer recently posted…Junipered Orange Slow Cooker Chicken + A Modern Gingham Jam Giveaway! Ha! So glad you like it Justine! I hope the move was relatively stress-free! And these look so delightful. I love how quickly they come together! Thanks Erin! It had its moments but all is well now! I’m glad you’re getting settled into your new place! 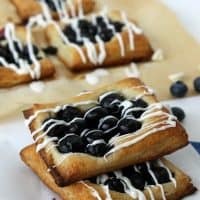 These tarts look awesome – my husband and I LOVE blueberries! Thanks Ashley! We can not get enough of blueberries! First of all – welcome to the Midwest! 🙂 And second, these are definitely getting made in my kitchen, my kids…okay, the hubs and myself too…will love them. Yay in the same state Heather! Thanks! Congratulations on the move! I grew up in the Midwest so it holds a special place in my heart 🙂 These little tarts look like the perfect back to school sweet treat…yum! Awe I didn’t know that! I am liking it so far! Wow!! Who knew 3 ingredients could turn into something so awesome! 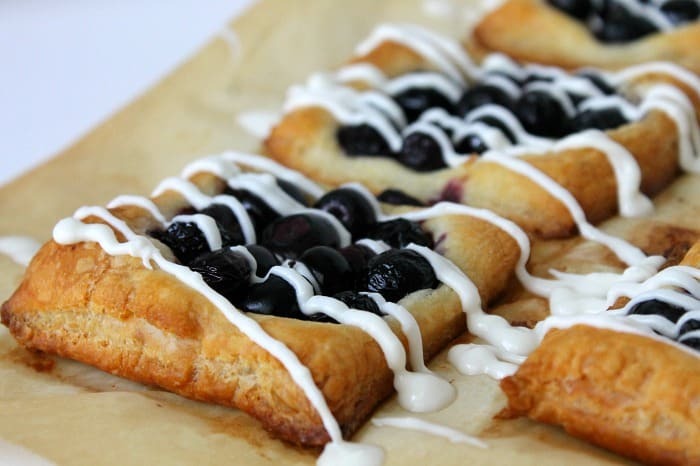 Puff pastry is so great to have on hand to make quick treats like these. Love the white chocolate drizzle! Congratulations on your move! I hope you are able to settle into your new home easily. What a pretty dessert! And you can’t beat a 3-ingredient list. Thanks Dara! We are slowly getting settled but so far so good! Best of luck in your new location, Nancy! I know moving isn’t easy, but it certainly gets better quick. 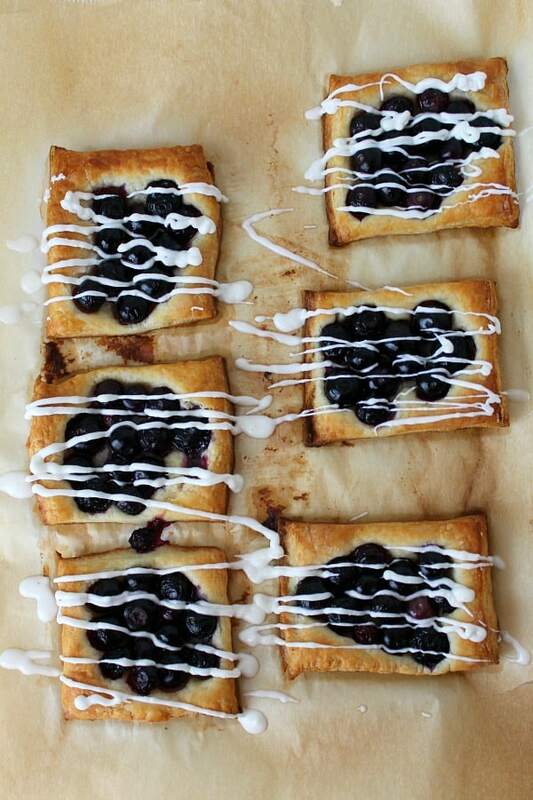 These tarts look outrageously good — I can never get enough blueberries! These look like exactly what I want/need!!! Absolutely delicious! These look wonderful, I love that blueberry white chocolate combo! I hope you and your family are starting to get all settled, and that you’re loving your new home! Moving is so much work! Hope you continue to settle in well. These look amazing.